DDMI is the main methodology being developed throughout the life of the project. The process is being led and refined by the academic partners to facilitate collaboration between science and design experts. DDMI aims to bridge different approaches in order to create new recycled materials that are informed by, as well as drive, the market for new sustainable products. The process of developing the methodology works like a road map and is crucial to the workshops attended by the partners. Tools to support the methodology include physical workshop activities based on interactive charts, card games and score sheets, all designed to evolve the knowledge exchange and ideation process. These sessions are carefully co-ordinated to make breakthroughs, resolve challenges, refine innovation and generally to manage and direct the expertise and insights within the project. Cotton and polyester, mainly in blends, make up 80 percent of fibres used globally. Both industries present serious environmental problems, many of which are in developing countries. 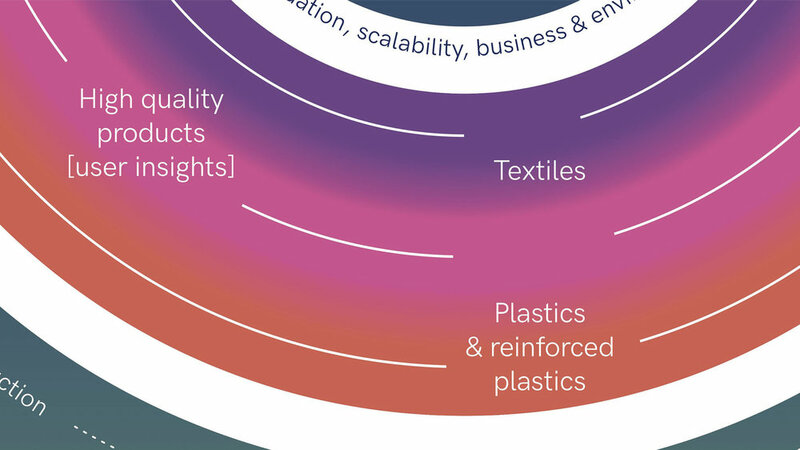 With global textile waste doubling annually in volume in many areas of the developed world, the T2C consortium believe fibre regeneration in tandem with recycling can help to address most of these issues. T2C aims to develop mass producible circular fibres: a cellulosic from recycled paper and card production waste and a closed loop recycled polyester from used clothing. Current mechanical methods of recycling result in poor quality fabrics suitable only for industrial applications. T2C proposes an innovative model whereby paper and textile waste are chemically recycled, resulting in the production of fabrics that are the same quality as new materials. The scientific partners refine and innovate in the field of fibre regeneration in order to develop new cellulose and polyester fibres that meet future industry expectations. Design approaches drive the consortium work and include academic partners reviews, tests and assessments of the scientific output, looking specifically at the potential for viable, marketable new product concepts where scalability is possible. Specifically designed lifecycle charts are being developed in conjunction with strict life cycle assessment processes for the analysis, and together form a communication bridge to industry enabling the creation of design prototypes with ‘accountability’. A big challenge with recycling is processing blends. In order to create regenerated fibres from waste, the ability to separate the fibre at the recycling stage is imperative due to the different chemical processing requirements. Feasibility studies are being carried out to assess future market viability and to help analyse which innovations and processes realistically are best to progress. The studies take into account long- term circularity in the broadest sense. In the latter stages of the project, research and innovation merge together to create a portfolio of final prototypes. Three products are being shortlisted via new tools that assess 'success' potential from the perspective of each partner. These will undergo full LCA testing and will then be further developed to market readiness. Throughout the project the academic partners refine and develop the DDMI approach and tools. These form a crucial part of creating successful cross-discipline circular innovation and the consortium recognises the potential for it’s use in other market areas relating to circular design.